If your child loves listening to classical music and he or she wants to start playing the violin, you might want to know what makes a good youth violin. Fortunately, we have an article on that, and if you want to find more about this beautiful instrument you can also read another one of our popular posts. 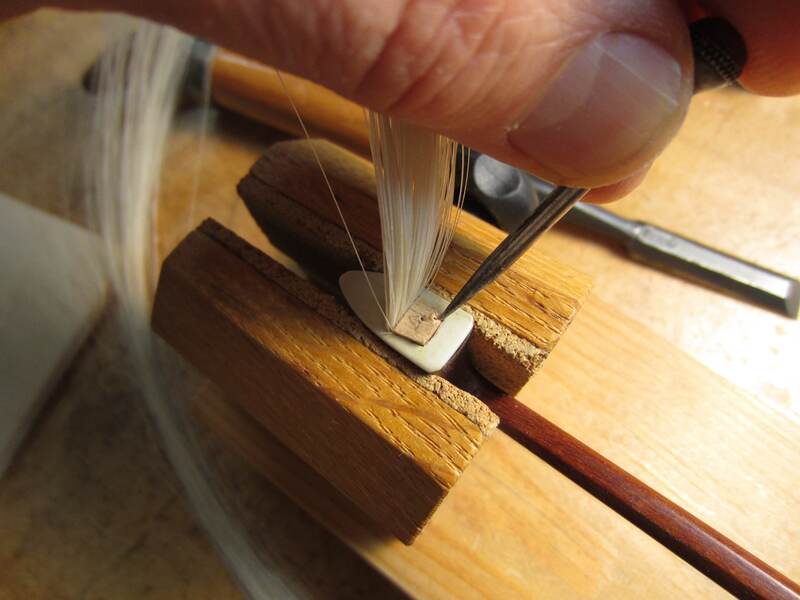 The part of the bow that touches the strings and it’s thus arguably the most important is the hair. Although a synthetic equivalent of this material is sometimes used in bows, that is not recommended. 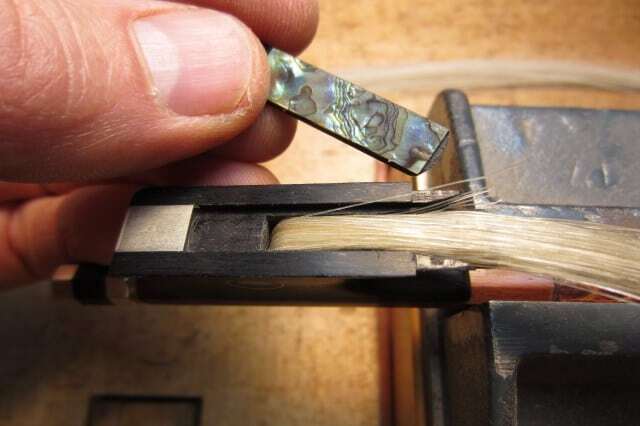 A good violin bow is usually made of hair coming from horses’ tails. Those that make bows have a number of horse breeds to choose from. Siberian, Manchurian, Mongolian or Polish are usually the breeds that offer good hair, although recently, Argentinian horsehair has become popular too. As experts say, the hair coming from Siberian horses is considered the best. Due to biological reasons, mainly because the horses in northern climates need better protection against the cold, their hair is stronger. Surprisingly, gender also has a role in determining the quality of the hair. Stallion hair is preferred because it’s usually cleaner than the hair of mares. The color and consistency of the hair are important too. Because the result needs to be a straight one, the hair that is used in making the bow also needs to be straight. If the hair comes with irregularities, these will produce scratches when the bow is played so the resulting sound won’t be a pleasing one. Color is not per se important, but if the hair is white, that is an indicator that it’s usually finer in texture. But that is only the case with violin bows, as those that make bows for cellos like the grabbier texture of black hair. The “spine” of the bow, or the stick, is the part that is usually made of wood. Pernambuco or Brazilwood are the main choices, although some manufacturers make their bow sticks out of carbon fiber. For inexpensive models, most of those that make bows choose brazilwood, and this is a generic name associated with different kinds of hardwood. As the name suggests, this wood originates from Brazil, but it can be found in other tropical countries too. Resulting in relatively low-priced bows, between $50 and $200, this is the kind of wood used in bows for beginners or intermediate players. Historically, for making the best bows, Pernambuco has been the wood of choice. It too comes from Brazil, it’s heavy and dense and it has the precise combination of strength, elasticity, and responsiveness needed in a quality bow. Although it comes from different areas of Brazil, it has become a scarce resource due to environmental issues and intense exploitation. This is why Pernambuco has become even more desired because it’s so rare. It’s important to note that there are many subspecies of this kind of wood and choosing the best material is something that only a professional and experienced bow maker can do. However, due to the lack of this material, the bows now may be of lower quality, and thus, bows created in the 19th century are considered the greatest. Another consequence of this shortage is the appearance of carbon-fiber sticks. They have become a popular alternative lately. These bows are made of different grades of carbon fiber bound together using resin. Carbon fiber models are durable and they have many of the qualities of the Pernambuco ones, being cheaper to make. Inexpensive bows can also be crafted out of materials such as fiberglass, and these are usually found in the lowest-priced range. They are good for beginners because they offer durability while still being affordable. However, as the player improves, the need for a better and more accurate bow appears. In a violin bow, the frog is the end part that contains the mechanism which holds and tightens the hair of the bow. Nowadays, most frogs are made of ebony, as this is the most suitable material for this job, although some synthetic bows make use of materials that imitate ebony. 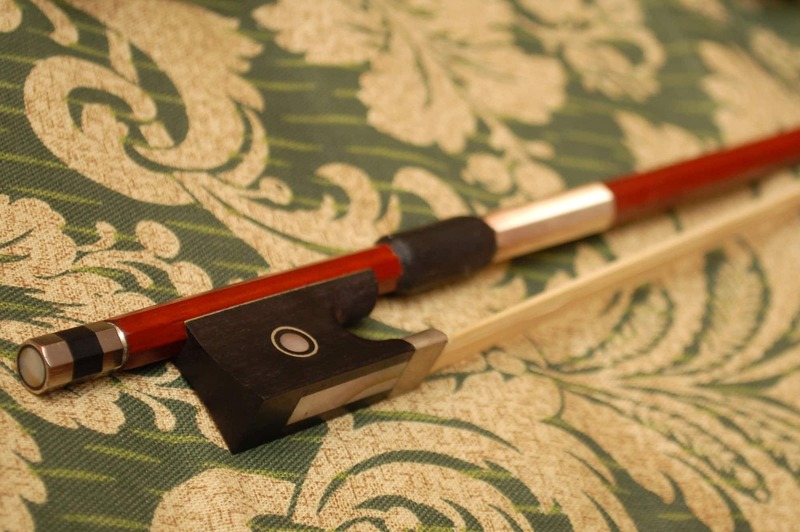 Older bows, such as those from the Baroque period use a wider variety of woods. Although small, the frog is a part of the bow that houses a lot of important parts. And despite the fact that each individual small part doesn’t account for much value, their total sums up to about 33% of the value of the entire bow. So a good frog is an important feature of any bow. The frog has gotten better and better over the time, as it initially was a simple piece of wood attached to the stick and it acted as a rail guiding the hair away from the stick. But the need to change the hair’s tension appeared and thus the frog needed an upgrade that came in the form of a notch and hook system that was called a crémaillère. A screw and eyelet system appeared in the 18th century and that was an improved version. The precise manufacturing of all the frog’s little parts is essential in ensuring the bow is a quality one. On top of this, the frog also has an aesthetic role and over the centuries, those that made bows continued to improve upon the frog’s design and looks. Nowadays, the frog is split into two parts, one that remains attached to the stick at all times and is called the throat, and another that is detachable and movable and is called the body. Players use this mechanism to reposition the frog and tighten the hair when they need to. The main purpose of this system is to keep the frog and the leather grip at the same distance all the time. Despite all the changes and attempts to improve the bow, the Tourte model, which appeared during the late 18 and early 19 centuries, is still the most popular and is considered the standard.